IBM announced its researchers have identified a new way to trigger the body's immune response by using polymer-coated graphene sheets. The research was recently published in Nature Communications. In the case of cancer treatment, to target specific tumors in the body, scientists have developed techniques where drug molecules are attached directly to the surface of a nanomaterial, such as graphene sheets. Combining the nanomaterial and the drug molecules, these "nanotherapies" could help clinicians treat tumors by transporting the drugs directly to the tumors, where they canbe released onto the cancer cells to help fight the disease. 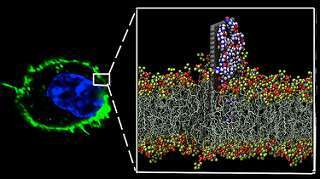 Previously, researchers had determined that nanotherapies require the application of coating molecules, such as polyethylene glycol, to be biocompatible and avoid damaging surrounding cells as shown in a previous study published in Nature Nanotechnology by the same team at IBM Research. IBM's new research indicates that the polymer-coated graphene sheets can have an inadvertent, previously unknown, secondary effect, which triggers the release of cytokine proteins. These proteins act as "signal flares of the body" and attract the body's immune cells like helper T cells (which relay the signal forward) and killer T cells (which kill infected cells) to the location of the graphene sheets. Simulations on IBM's Blue Gene super computer showed that the polymers attach the nanomaterials to cell surfaces, amplifying the initial signaling process. Research suggests these signals are broadcast within six hours of the nanodrugs being encountered. "We've essentially uncovered a new way for clinicians to to trigger the body's immune system to spring into action – which is not an easy task" says Dr. Ruhong Zhou, Manager, Soft Matter Science at IBM Research. "This discovery could represent an incredible development in precision medicine. If these nanomaterials were targeted at, say, tumors or virus-infected cells, one could, in principal, stimulate the immune system to attack cancer and infections at their source." Clinicians might couple immunotherapies like nanotherapies with the delivery of traditional drugs, which are already compatible with graphene surfaces. Coupling both nano or traditional pharmaceuticals and the body's own natural immune system response could form the basis for new ways for clinicians to fight human diseases.